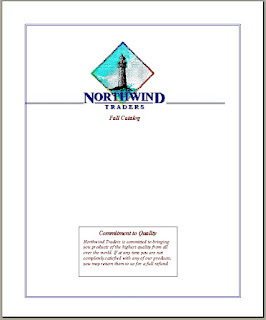 The above Document is imported from Northwind.mdb Database (visit the Page Saving Data on Forms not in Tables for location reference of the Database) without the Page Border (Catalog Report attached to Categories Table) and drawn a double-lined Page Border with the help of Code given below. 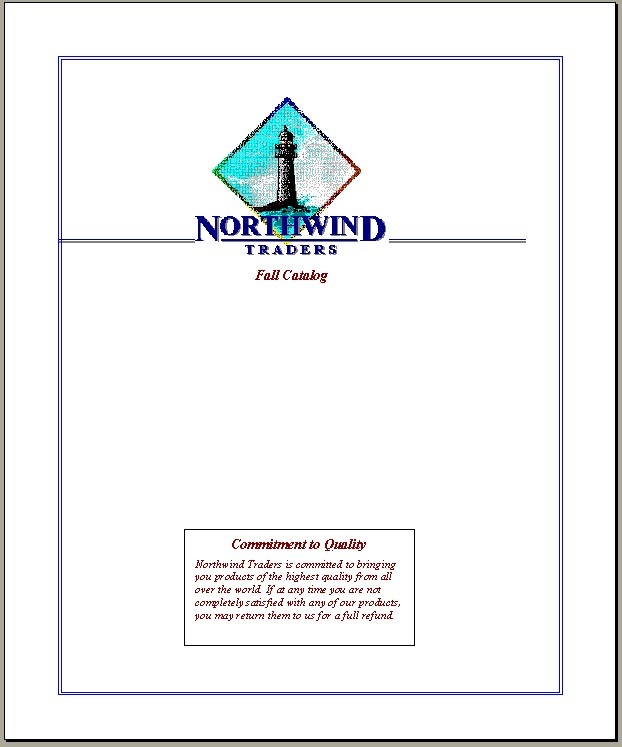 If you would like to try it out on the same Report then Import the Categories Table and the Catalog Report from Northwind.mdb database. The Code can be used on any Report that you wish to draw the Page Border and the border will be drawn within the Margin settings of the Page. Replace the name "Catalog" with the name of your Report. Print Preview or Print the Report.
' Set scale to pixels.
' Draw line as a box. 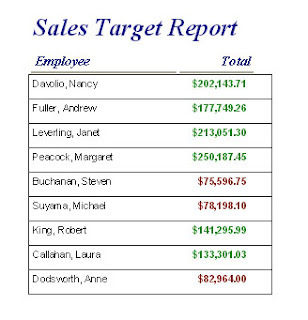 When the built-in Report Wizard prepares a Report, it draws a nice Page Footer (a sample image is given below) with System Date and Number of Pages etc.
' irrespective of its current position. 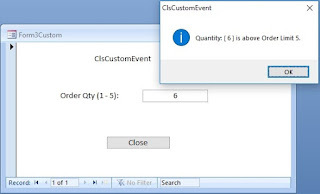 .ControlSource = "='Page : ' & [page] & ' / ' & [pages]"
.ControlSource = "='Date : ' & Format(Date(),'dd/mm/yyyy')"
The Program will check through the length of the Controls present on the Detail Section of the Report and add up the length of all fields to calculate the total length of the Page Footer. The Program assumes that the Controls are arranged close together without leaving gaps between them. Copy and paste the above code into a Global Module and save it. Run the code as you did for creating the Page Footer above. If you encounter any Error during compilation or Run time, visit the Page Command Button Animation and link the essential Library Files (7 or them) by going through the procedure explained there. Come back and re-try again. Pretty nice post. I just stumbled upon your blog and wanted to say that I have really enjoyed browsing your blog posts. In any case Ill be subscribing to your feed and I hope you write again soon!